The news today of former Rovers favourite Bongani Khumalo's availability after his release from Spurs certainly stirred something in Viking Chat forum user Copps is Magic! He started the Bring Back Bongs campaign. "Today was a momentous day for Doncaster Rovers as fans from up and down the country united together to urge manager Paul Dickov to bring back former player Bongani Khumalo in a campaign called 'Bring Back Bongs'. The BBB campaign for short is sure to gain a great deal of momentum and if enough people tweet about it some journalist is sure to pick it up as fact. A spokesman for the campaign said "we're after a re-tweet but the sky's the limit". If you ask most rovers fans for their favourite ever South African international to play for the club then most will reply with either Dean Furman, Quinton Fortune or Bongani Khumalo. That these are the only South African Internationals to play for rovers should not detract from the fact that Bongs (as he is affectionately known to fans) places in a solid top 3 position in all polls. Bongs endeared himself to the rovers' faithful in the 2013/14 championship season - a year which saw the constant change of a defense plagued by injury. Bongs was the rock who kept the ship together playing alongside the likes of Jones, Tamas, Meite and Quinn. The strengths of Khumalo are his ability in the air, pace and general solidness at the back. Perhaps the only doubt surrounds his positional play which occasionally baffled supporters sitting in the west stand who could be heard muttering things such as "what is he doing there" and "where's he going now". Luckily, for those of us who sit in the south stand we can't see such nuances in play so we all thought he was a great player. Like many, however, Bongs eventually succumbed to the 'keepmoat curse' and suffered a serious-injury to his kneecap in an international friendly against Brazil in March of that year. This seemingly signalled the end of Bongs rovers career. As with all major injuries, many people questioned whether Bongs would ever be the same player again. Luckily, Bongs made a full recovery and made a return to action for Colchester in March of the 14/15 league one season. By all accounts, Bongs was instrumental in Colchester making a miraculous turn-around to avoid the drop by winning 5 and drawing 3 of their last 10 league games. 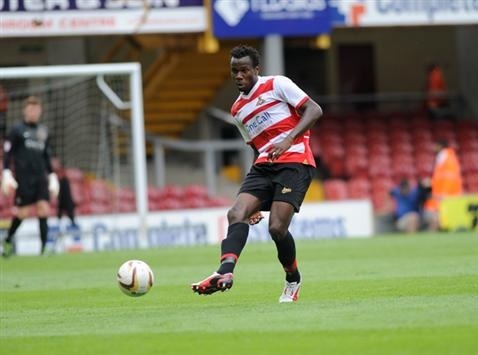 Bongs has therefore proved he is a solid defender at both Championship and League One level. The fact that he was recently released by Spurs and is looking for a club in England has perked up the peckers of Rovers fans wishing for a swift return for this loveable giant. To this end, fans have rallied around the 'BBB' campaign to urge Paul 'Vo5 Casual control putty' Dickov to get on the blower and get in touch with Bongs' representatives. The campaign is also currently considering whether or not to start a crowdfunder project to raise money to buy Dickov a pen to make the signing happen quicker."